And if the video doesn’t make your mouth water, we don’t know what will! Let us know what you think. P.S. To make this dish perfect, don’t forget to check out the tips at the bottom of the recipe. 1. Prep a bowl of cold water and add a couple of pinches of Salt. 2. Wash and cut the Eggplant in semi-circle and drop into the bowl of water right away. 3. Give it a mix and drain water when ready to cook. 4. In a pan on medium heat, add the Ghee and Butter and allow it to heat up. 6. Add in the Cumin Seeds, Sesame Seeds and Turmeric Powder and allow the Sesame Seeds to pop. 7. Add in the Garlic and Green Chili. Mix and cook for 15-20 seconds. 8. Mix in the drained Eggplant and add Salt and Red Chili Powder and mix well. 9. Cover and allow the Eggplant to cook till tender. 10. Allow the Egglant to cook for 8-10 minutes, stirring every 2 minutes for even cooking. 11. Once done, remove the lid and give it one good mix and add the Sour Cream. 12. Mix gently to avoid the Eggplant becoming a mash. Check spices and seasonings and adjust if needed. 13. If you’d like to add increase the protein, add the Hemp Seeds and again, mix well but gently. 14. Garnish with chopped Cilantro and serve hot with Chapatis. 1. Soaking the cut Eggplants in salted cold water avoids discoloration and removes the bitterness of the seeds, if it’s not a fresh Eggplant. 2. Adding some Ghee to the Butter avoids the spices from burning as Ghee has high smoking point and Butter, low. 3. Poke a sharp knife into Eggplant to check if they are cooked well, if the knife goes into it like melted butter, its done. 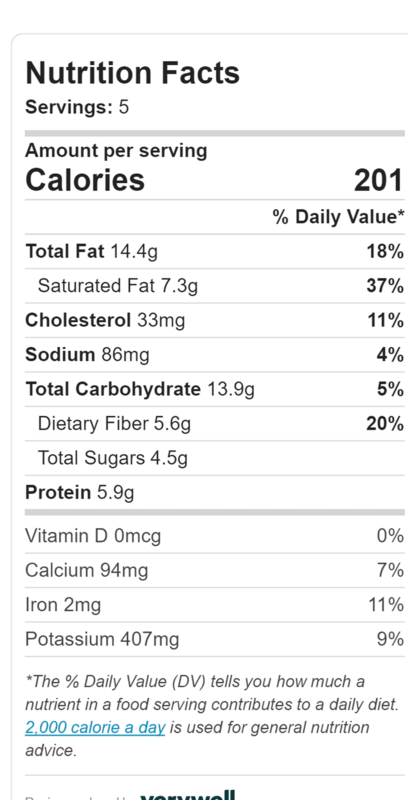 The Nutritional values given below are approximate.